It's no secret that cookie dough is one tempting treat. It's delicious but, sadly, potentially dangerous if made with raw eggs that pose a risk of salmonella. During holiday cookie-making season, the Centers for Disease Control (CDC) even reminded everyone to stop eating dough made with raw eggs. Like that really stopped anyone. Luckily, there are plenty of places trying to make cookie dough-eating safe for all. Some recipes omit the use of eggs completely, while others, like Ben & Jerry's, use heat-treated flour and pasteurized egg yolks to prevent the spread of foodborne illness. 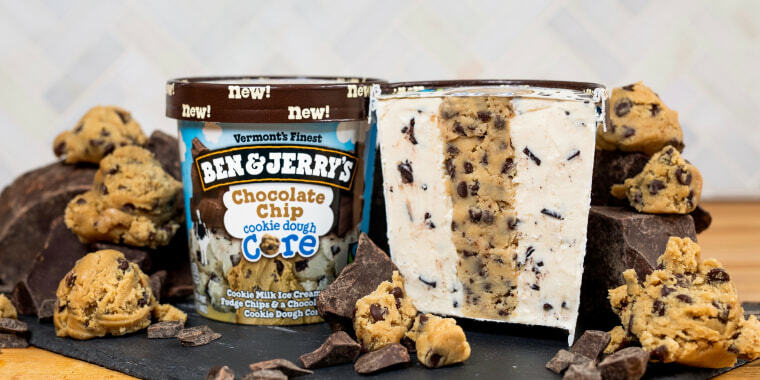 Now, Ben & Jerry's just crafted what cookie dough lovers have been craving for years. Fun fact: Ben & Jerry’s claims to be the first ice cream company to add cookie dough to ice cream back in 1984. The brand's "Core" line of flavors have become a popular addition to the Ben & Jerry family since they first hit test markets in 2016. Most cores are swirly centers of salted caramel, peanut-butter fudge or chocolate cookie. But the new cores are all about the dough, which the company assures customers is totally safe to eat. Together, there are three new pints of cookie dough goodness. Chocolate Chip Cookie Dough Core is like the original cookie dough ice cream, which Ben & Jerry's said is its best-selling flavor in the world. It's made of cookie milk ice cream with fudge chips and a wonderfully thick center of chocolate chip cookie dough running through the middle. Sweet Like Sugar Cookie Dough Core is for all those people who prefer shortbread or cherry pie over something chocolaty. On one side of the sugar cookie dough core, there's sweet cream ice cream with a hint of almond flavor and shortbread cookies. The other side is like Cherry Garcia (the brand's second best-selling flavor) with cherry ice cream and cherry pieces. The other flavor is for all the true dough heads out there. Wake & “No Bake” Cookie Dough Core is a mix of vanilla ice cream with peanut butter cookies, peanut butter ice cream with fudge chips and a core of chocolate cookie dough. All three recipes are a nod to the company's best sellers in the U.S. during 2018. Half Baked topped the list, then Cherry Garcia and Chocolate Chip Cookie Dough was third. When the iconic ice cream company tested bags of edible cookie dough chunks in Vermont only, there was a lot of hyped about taking the treat nationwide but now everyone can enjoy lots of dough. The new pints are available in all Ben & Jerry's scoop shops and major retailers now (though a Ben & Jerry's spokesperson told TODAY Food that some markets may continue to roll out the products throughout the month) for $4.29 to $4.99.